Before we go any further, let’s make sure you are at the right place. If you nod your head “yes” to each of the following statements, you will be very glad you’re here because SaferTrader and the Monthly Income Machine were designed specifically for you! I want more monthly income – much more. (My stock and bond dividends, CDs, and/or money market interest are not enough). I am not interested in taking on substantial risk in my pursuit of income (safety first!). I do not have the time or the inclination to devote hours every day to trading the markets. I am immune to silly hype leading to $1,900 webinars and 26-disk CD tutorials. Still with me? Good. Let’s proceed. You can earn a substantial monthly rate of return conservatively, without accurately “forecasting” market direction, and without a bottle of antacid standing by to treat the stomach-churning account value declines that often accompany stock market gyrations. The foundation of the “Monthly Income Machine” is a comprehensive, detailed how-to book, the definitive manual for conservative investors seeking high income. In addition to the clearly spelled out “rules” for trade entry and management detailed in “The Monthly Income Machine,” you will have direct access to the author/developer of the “Monthly Income Machine.” He will be with you every step of the way on your road to producing a welcome monthly income stream. In addition to the book itself, you will also receive the ongoing series of how-to “white paper” articles and book updates, personal coaching by the author should you have any questions, and access to the members-only discussion Forum. There is even a separate optional subscription service available to current registered owners of the book that pre-identifies conforming candidates for you. While this optional service obviously reduces the time involved in identifying conforming trades, it is not necessary for using the powerful investment technique fully explained in the book itself. Properly designed option credit spreads, and the supremely efficient Iron Condor credit spreads, are the best path to meaningful monthly income. The Monthly Income Machine is the distillation of much of what I’ve learned during my 30 Wall Street years as a broker and/or private investor. It’s everything I’ve learned about producing a strong, reliable stream of income, month in and month out, irrespective of the market’s roller coaster swoops and gyrations. It remains the only investment technique I use in my personal accounts. The bottom line is that after you finish the book, you will be able to use the same “one best investment technique” yourself to intelligently, safely, and confidently seek a fresh supply of very meaningful income every month. You can – next month – be on your way to realizing $800+ on every $10,000 margin used in your account. Properly designed option credit spreads, and the supremely efficient Iron Condor credit spreads, are that path. Before deciding to read the book and to join the SaferTrader investment community, you should – and probably do – have several questions. Let me try to anticipate and address a few of those questions. My name is Lee Finberg and I’ve spent much of the last 30 years with Wall Street firms as a broker, Branch Manager, and former Vice President – Investments with Paine Webber and Prudential Securities, or as a private investor for my own accounts. Most of my adult life has involved working with clients’ and my own accounts, authoring several financial books, writing a syndicated newspaper column on the markets, and participating in national and international investment seminars as a featured financial speaker. Today, no longer a broker with a brokerage firm, I am my only client. The “Monthly Income Machine” trades are the ONLY investments I make in my own personal accounts. How can a monthly return target of 8% be the product of a conservative trading plan? Unlike traders making outright purchases of out-of-the-money options who seek a very high rate of return with a low probability of success, each of our Monthly Income Machine positions focuses on achieving a high degree of certainty of producing profit. I didn’t invent the Credit Spread and the Iron Condor, but I have developed and refined what I find to be a wonderful strategy for using these magnificent investment vehicles to create monthly income conservatively and reliably. The Monthly Income Machine provides the map every income investor needs to safely chart a course to a reliable income stream in any market environment – up, down, or sideways. 2. making certain that your brokerage account is with an “options-friendly” brokerage firm (firms that are not options-friendly will require margin for both sides of the aforementioned Iron Condor – thus cutting your rate of return in half!). Lee, Isn’t it true that most option traders lose money? Yes. Very true… and that fact is very helpful to those of us who take advantage of the Monthly Income Machine! The reputation options have as “risky” is well deserved. But that’s because most option participants are using them as a vehicle for speculation, and are paying a premium on every trade in their Lotto-like pursuit of making a killing. It is an incontrovertible fact, demonstrated in many studies, that most option traders buying out-of-the-money options lose their money when the options, as they usually do, expire worthless. The money they lose goes to someone! That “someone” can be the knowledgeable income investor: Me… and You if you arm yourself with the correct tools and use them systematically. How complicated is the Monthly Income Machine system … I neglected to get a Ph.D. in mathematics? It is not complicated. You will learn and use a step-by-step blueprint for trade selection, entry and trade management because these unique “rules,” and the reasons for them, are explained in detail and are easily implemented. Each month, you will be able to identify appropriate trade candidates and enter your orders for that month. Accordingly it is ideal for investors who want additional income, whether they are busily enmeshed in their careers, or are retired and want more than their fixed income investments are providing. Yes. Although you do not need to place your orders via computer if you prefer calling them in, you do need certain real-time information conveniently at your fingertips to operate the Monthly Income Machine. The necessary data are most efficiently accessed online via your brokerage firm website. I most emphatically do use it myself. In fact, after three decades of professional market involvement as a broker and financial adviser, it is the ONLY investment technique I now use for my own accounts. What I am offering you has value – a very great deal of value. So no apology should be needed for my wanting to cover the time and costs of producing and distributing the book, working directly with the Monthly Income Machine readers afterwards, and hopefully producing a profit as well. I truly delight in teaching. Nothing gives me greater satisfaction. Martin D. Weiss is one of the most respected financial analysts in the world. His investment and financial watchdog expertise has earned public praise from Barron’s, the New York Times, Forbes, and even the U.S. General Accounting Office. You’ve probably seen him interviewed on NBC, Fox, and other major networks’ business programs. Here’s his assessment of “The Monthly Income Machine” and of my track record for sharing knowledge. I’ve worked with and advised clients with all types of trading accounts throughout the U.S. and abroad – from small speculative accounts to the large accounts of Chairman of the Board of a worldwide hotel chain and of a major oil production giant. Working with clients for all those years, speaking to thousands more through previous books, a newspaper column, and as a financial seminar featured speaker, I’ve pretty much seen and been involved with every approach to investing. I ‘m confident that I know what really works… and what doesn’t. The lessons learned were tough ones. The investment mistakes clients made (and I made some, too) were not a pretty sight. The investor who believes that simply buying high-dividend stocks and holding them through thick and thin to produce the “safe” income stream he wants, will often suffer disappointment. Dividends get cut, or eliminated. The stocks themselves can fall, wiping out the value of the dividend payments. And most significantly, investors who seek income through stock dividends tend to be “buy-and-hold” investors. In my experience this can be a head-in-the-sand investment philosophy that can, and sometimes does, produce disastrous consequences. (think Enron, Lucent, Fannie Mae, etc.). The best route for producing income from the markets is much different from the good approaches to stock appreciation over time. In short, it’s safe to say that stocks are demonstrably often not the best path to high levels of income from the markets. Adrian Day is a widely respected authority on, and pioneer of, Global Investing. He heads a firm that manages accounts for individuals and institutional clients worldwide. Here’s what this alumnus of the London School of Economics says about The Monthly Income Machine. Louis Mendelsohn helped pioneer today’s multi-million dollar trading software industry. He is a world-renowned technical analyst, prolific author on technical trading, and prominent developer of trading software encompassing the global, interconnected financial markets. His authoritative articles on profiting in the markets have appeared in Barron’s, Futures, The Journal of Trading, Technical Analysis of Stocks & Commodities, and the Journal of Commerce. The soft-cover book includes the identical step-by-step “entry criteria” and trade management techniques I, and the SaferTrader community of income seekers, use to generate a stream of monthly income. I will be available, as part of your included SaferTrader membership, for some direct consultation with you via email to answer your questions and even to review your initial contemplated “Machine” trades. And I will endeavor to respond to your inquiries within one business day. In addition to the Monthly Income Machine, SaferTrader participants will automatically receive my specialized how-to reports covering less widely known, extremely powerful guides to capturing low-risk market revenue. How to Earn Additional Income on Stocks You Already Own! How To Buy a Stock at a Price Below the Market (yes, you read that correctly)! You won’t need it, but it’s there. You have a money-back, no questions asked guarantee. If after 60 days you do not find the Monthly Income Machine and related SaferTrader community program benefits exactly what you needed, just let me know and your purchase price will be refunded. Go through the book at your own pace. Follow the easy action steps summarized in the Entry Criteria Checklist, and apply them to each month’s credit spread and Iron Condor trades you are considering. Now after 60 days, if your Monthly Income Machine results do not convince you that you can substantially increaase your current income every month, I insist you send the program back… and we will promptly issue you a full, no questions asked, refund. We Always Have the Edge – A Big One! I developed the Monthly Income Machine investment technique for my own personal accounts because the money lost by speculators buying unprotected out-of-the-money options has to go somewhere! Why not to me? And to you? Most option market participants pay a premium by buying options outright. Most of these option trades end up expiring worthless, resulting in the buyers of the options losing the premiums they paid. So, let me be the seller who “follows the money”… and collects those premiums! Let’s dig a little deeper so you can see exactly why and how the Monthly Income Machine works for you by scooping up the premium dollars the outright purchasers of out-of-the-money options so willingly donate. The “machine” includes a set of very specific entry rules and adjustment techniques that enable us to reliably and safely harness the inherent power of the option credit spread and Iron Condor. Our income target is an average 8% return on investment per month… $800 on every $10,000 of margin funds employed. There are common sense reasons why the technique you will learn is able to produce this kind of income return using very conservative trades (NOT naked short selling), and to do so consistently. As you read the book, you will understand clearly why the deck is emphatically stacked heavily in the favor of income investors who correctly use credit spreads and Iron Condors. There are two sides to every trade, the buyer and the seller. With options, we can rely on numerous rigorous studies that conclude the seller has at least a 3 to 1 advantage over the buyer. Therefore we are always net sellers, not buyers. That’s why it’s called a credit spread… the money you receive when you establish the credit spread is credited to your account as soon your order is filled, and is permanently locked in if the option expires worthless as expected. When you place a Monthly Income Machine trade, you are not spending money, you are receiving it, and you get to “bank” it permanently when the option expires without the underlying stock or index having reached your credit spread prices on options expiration day. Instead we sell carefully constructed spreads thereby producing controlled-risk trades with lower margin requirements. Every option has a Strike Price, the predetermined price at which you have the right, but not the obligation, to buy the option (if it’s a Call) or sell the option (if it’s a Put) any time up to and including option expiration day. A credit spread is a combination position. You simultaneously SELL one option and BUY one option with a different Strike Price on the same underlying stock, ETF, or index. (The one you buy is simply there to protect the one you sell, and to greatly reduce the margin requirement). The specific construction we use for the spread will always result in you receiving more money for the option you are selling than you pay for the one you are buying. That net difference is the premium credited to your account… and thus becomes your income. Credit spread positions are essentially non-directional. This means that instead of trying to predict a short-term future price direction for the underlying stock, ETF or index, we base our credit spread trade selection on prices we believe the underlying stock or index won’t reach by next month’s option expiration day. Therefore, we don’t give a hoot if the market and/or the underlying stock or index goes up or down or stays where it is, so long as it doesn’t reach our spread before the options expire. Since we are selling a credit spread and collecting our profit (the premium) on the trade up front, we want the premium to decline and melt away to zero at expiration. Finally, a tremendous advantage we enjoy – as sellers of credit spreads – is that the mere passage of time erodes the premium value of options, further nudging the premium toward zero. And zero is where we want it to be when the option expires. In fact, it is that immutable law of options “time decay” that works continually and destructively against the outright buyer of options…and all to our benefit! Basics – Brief discussion of option basics focused on those elements that are important to the Monthly Income Machine do’s and don’ts (direction, volatility, time decay, strike price, and premium). Key Decision Making Data – Which pieces of information are needed to guarantee conformity with the “Machine’s” required trade entry criteria, and how we use them. Meeting the “Greeks” and how we employ two of these mathematical values (already calculated for us) to establish that the contemplated trade position meets our demands for a trade with a very high probability (always greater than 90%) of success. Additional Power Considerations… and they are important! … and it even comes with a co-pilot (me). Once we have determined what stocks or indexes are potential candidates for our credit spreads and/or iron condors based on the Monthly Income Machine rules, we need to determine what Strike Prices to use for the options that make up the spreads. Importantly, we want to use Strike Prices that are so far above or below where the market is now, that there is only a slim possibility that the underlying stock or index can reach these prices prior to the options expiration day. But “distance from the market” is not nearly enough; the Strike Prices chosen must also meet Monthly Income Machine requirements for amount of premium to be earned, delta value, and the strike price interval between the spread’s option legs among other criteria. That price level we determine to be “well out of reach,” and thus the starting point for a contemplated credit spread, is one of the trade “entry criteria” spelled out fully in the book. You will be able to quickly determine precisely what option credit spreads are distant enough from the current price of the underlying stock or index as to meet our high probability of success criteria. The next item along the step-by-step path to confirming whether or not those strike prices meet all the entry criteria is to simply look at the appropriate “option chain” screen at your brokerage site. As you can see below, the various Strike Prices available for a stock or index option run down the middle of the table. The last prices paid, the current bid and ask prices, and today’s trading volume are shown for each Strike Price. We can mathematically quantify, before we place the order, the likelihood that our trade will work out as we wish (don’t worry, the math is done for us and the figure we need is displayed on your broker’s website along with the symbol, current quote, etc). In the infrequent situation (but sure to occur sometime) that the trade is going the wrong way and appears headed for a loss, you will have at your fingertips three powerful Monthly Income Machine trade adjustment techniques. These techniques represent mid-course corrections that can further reduce the relatively small loss on that trade, and often turn the trade into a winning one after all. Thank you Howard N., New York, N.Y.
Best of all, the Monthly Income Machine technique makes use of the mega-powerful Iron Condor – two credit spreads on the same underlying stock or index. One spread is substantially above the current underlying stock price (the bear call spread), and one spread is well below it (the bull put spread). Each of the two spreads comprising the Iron Condor must meet all the Monthly Income Machine entry criteria. 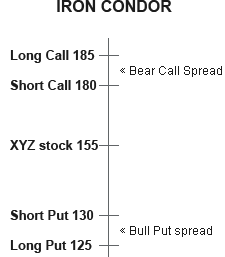 The following diagram is a snapshot view of an Iron Condor consisting of a 180/185 bear call credit spread and a 130/120 bull put credit spread. So long as XYZ stock – currently trading at $155 – is below $180 and above $130 when the options expire, you bank both premiums you received when you established the Iron Condor the previous month. So long as your account is with a brokerage firm that treats margin requirements fairly, you only need to meet the margin requirement for one of the two spreads of an Iron Condor– not both! That’s because it’s obviously absolutely impossible for the underlying stock to be simultaneously above 180 and below 130 at options expiration day. The result of only needing to meet one margin requirement is that you DOUBLE your return on investment with the Iron Condor, but this is only available with some brokerage firms. Note that ALL of this necessary information is easily available on one or two screens at your options-friendly brokerage website. The book provides you with an actual summary checklist for you to use with every potential trade to confirm it’s a conforming, low risk position. Which stock, ETF, and stock Index options should you consider for your income trades? The entry criteria for spreads on individual stocks differ from those we use for ETFs and indexes like the S&P, Nasdaq, and Russell Small Cap. There is a minimum underlying stock price for use with the Monthly Income Machine in order to filter out stocks too inexpensive to provide us with sufficient option premium. What is the proper number of days-remaining-till-expiration (a range) that we must have in order to provide sufficient premium, in a short enough time period, to make the trade worthwhile in terms of our 8% per month return on margin investment target? If using a stock option credit spread (as opposed to a stock Index credit spread), when is the next earnings report? If there is an earnings report due on our stock based credit spread before next month’s option expiration day, we don’t do the trade! Related to the previous criterion, is there anything in the news about the stock we are considering that suggests there is, or may be, a takeover offer associated with the company? If there is such a possibility in the news, it’s also a dis-qualifier as a Machine trade. Referring to the option chain screen, which option strike prices meet three separate minimum distance-from-current price requirements for the credit spread or Iron Condor, i.e. how far must the underlying stock price today be from the option strike price we select? Does the contemplated credit spread offer the specific minimum premium we will accept on this trade? If it’s below a certain figure, we stop here because the trade fails one of the entry criteria tests. If it does qualify, we move ahead with the checklist. Does the credit spread meet the specific volume and open interest minimums to provide the necessary liquidity in the event that we want to exit from the position before option expiration day (the third Friday of each month). Does the underlying stock, ETF or Index meet our specific minimum volatility requirement (we want options whose underlying is sufficiently volatile as to offer us an acceptable premium). When the Monthly Income Machine trade being considered meets ALL of the entry criteria, the trade will have a greater than a 90% mathematical probability of success. … meaning that there will be a very high mathematical likelihood that the options in the credit spread will expire worthless on the third Friday of the month… which is exactly what you want. The probability criterion you use is the “Delta” value. It’s derived from a theoretical pricing model, and is calculated for you at the brokerage website for any credit spread you are considering. Many brokerage firms provide (1) low commissions, (2) no cost access to real-time quote and analytical data, (3) an easy-to-use website, (4) ability to handle stock, bond, mutual fund and futures as well as options, and (5) knowledgeable customer service staff who respond immediately to phone and email inquiries. But that is not enough! Only some major brokerages are completely options-friendly. Those are the firms that only require margin on one of the two credit spreads of an Iron Condor. If the answer is: “we only require margin on one side of the condor,” you are fine, at least with respect to margin policy. If the answer is: “What’s an Iron Condor?” or “We require margin for each of the credit spreads of the Iron Condor,” YOU SHOULD NOT USE THAT FIRM for your Monthly Income Machine or other options accounts. NOTE: If your current brokerage house does not meet the options-friendly test, I will refer you (no obligation, of course) to the top three major firms recommended by SaferTrader that do meet the requirements. Each of the three meets all the tests for “option-friendliness,” including the critical Iron Condor margin advantage. Now after 60 days, if your Monthly Income Machine results do not meet your expectations, I insist you send the program back… and we will promptly issue you a full, no questions asked, refund. Simply put: you make the promised income, or you don’t pay a single penny. $0.00 cost You are automatically a member when you receive The Monthly Income Machine. The ONE BEST investment technique for earning a reliable monthly income from the markets. It’s yours with no risk. Bank the income or send the book back. And let me hear from you! I look forward to adding your story to the many testimonials we’ve already received. Also available at Amazon. Same price, but only orders placed at this SaferTrader site can be for either physical or digital (e-book) version of the book, as well as Lee’s “white paper” series of articles covering professional tips for enhancing rate of return and access to members-only discussion Forum. U.S. Government Required Disclaimer: Commodity Futures Trading Commission. Futures and options trading have large potential rewards, but also large potential risk. You must be aware of the risks and be willing to accept them in order to invest in the futures and options markets. Don’t trade with money you can’t afford to lose. This is neither a solicitation nor an offer to Buy/Sell futures or options. No representation is being made that any account will or is likely to achieve profits or losses similar to those discussed in this book or on this website. The past performance of any trading system or methodology is not necessarily indicative of future results. Author’s Additional Disclaimer: The information contained in this book represents methods I have developed and use personally, but I cannot and do not guarantee that you will make money, or that you will not lose money, employing the techniques, strategies and markets discussed herein. I am no longer a registered financial/investment advisor/broker and am not associated in any way with any investment firm except as a client trading my own accounts. You should not trade any market, any methodology or any system with funds you cannot afford to lose. All trades, patterns, charts, systems, etc., discussed in this document and the product materials are for illustrative purposes only and not to be construed as specific advisory recommendations. All ideas and material presented are entirely those of the author. No system or methodology has ever been developed that can guarantee profits or ensure freedom from losses. No representation or implication is being made that using the Monthly Income Machine methodology or system will generate profits or ensure freedom from losses. Each individual’s success depends on his or her background, dedication, desire, and motivation. Material Connection Disclosure: You should assume that the author of this document has an affiliate relationship and/or another material connection to the providers of goods and services mentioned in this message and may be compensated when you purchase from a provider. You should always perform due diligence before buying goods or services from anyone via the Internet or offline. THE PERFORMANCE EXPERIENCED BY USER COMMENTS AND TESTIMONIALS, ON THIS PAGE AND/OR OUR WEB SITE, IS NOT WHAT YOU SHOULD EXPECT TO EXPERIENCE. ALTHOUGH SAFERTRADER.COM ACCEPTS THE TESTIMONIALS IN GOOD FAITH, SAFERTRADER.COM HAS NOT INDEPENDENTLY EXAMINED THE BUSINESS RECORDS OF ANY OF THE PROVIDERS AND THEREFORE HAS NOT VERIFIED ANY SPECIFIC FIGURES OR RESULTS QUOTED THEREIN. THESE RESULTS ARE NOT TYPICAL, AND YOUR INCOME OR RESULTS, IF ANY, WILL VARY AND THERE IS A RISK YOU WILL NOT MAKE ANY MONEY AT ALL. NONE OF THE USERS HAVE BEEN INCENTIVIZED TO SUBMIT THEIR COMMENTS.